Berlin Gate was built in the second half of the sixteenth century. Initially he had one chamber and it was called the Gate Górzyńska (Long Causeway). He was the last of the three obstructed transitions that you had to pass to get into the city. Then you get through it could only by a wooden drawbridge. To this day, preserved pillars of dĽwigały probably a massive gate. Made available to travelers it was only in 1604 for reasons of defense. The original form of the gate was a building, dwelling official who is the commander of the crew, in the nineteenth century fortress engineer. Its present shape and the name took on in the years 1877-1879. Then the place of the bridge, mostly for reasons of communications, took a wide causeway and there are two chambers. The emergence of trams in Kostrzyn meant that ran through her twin track tramway traction, after which today can be seen marks on the vault. Most likely, then it appeared the inscription "Boehmerwald" ("Bohemian Forest") indicating a nearby tavern at the same time and at the same time recreational park. In 1931, after the liquidation sister Gates Sarbinowski placed over her iron Prussian eagle, which eventually shaped its distinctive appearance. Currently Gate Berlin has been almost entirely restored and is open to the public free of charge. In rooms bramnych There is also a Tourist Information Point and exposition of relics of Old and New Town. The biggest attraction of the museum is a tin lid of the coffin of Catherine of Brunswick (1518-1574), wife of the founder of the fortress - Margrave John Hohenzollern. 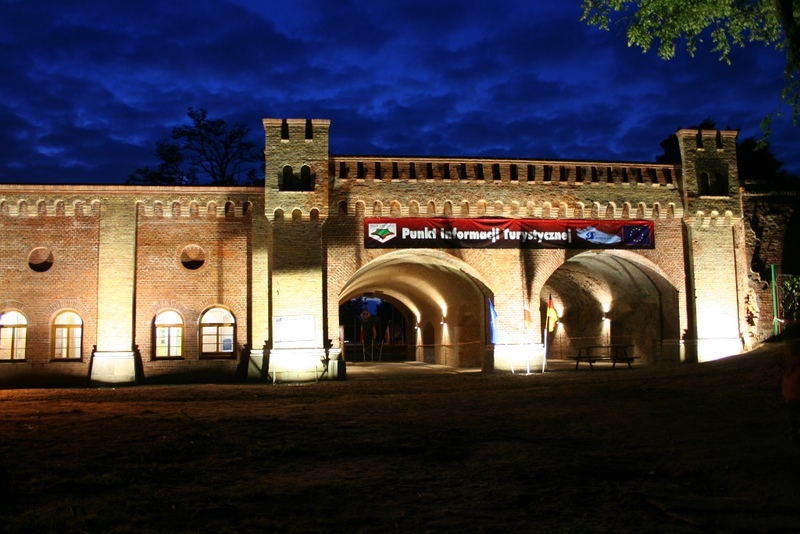 You can also buy souvenirs and Publishing Kostrzyn Fortress Museum on Old Town Square. We invite you to visit this beautiful object remembers the glory years of the Old City.